I absolutely adored Anna Mazzola's debut, The Unseeing, so wild horses couldn't have stopped me from reading The Story Keeper. As soon as I opened the book, I was instantly transported to 19th century Isle of Skye as Anna Mazzola describes the scenery in such vivid detail that I felt as if I was looking out of our protagonist, Audrey's very own eyes. A book that gives you goosebumps is always a good sign and boy, did I get goosebumps whilst reading this. I am partial to an odd fairy tale or two but the fairy folklore in this book will give you nightmares rather than sparkly dreams; the little people on the Isle of Skye are BAD! As well as the bad fairies, there are restless spirits and something or someone is causing young girls to disappear. Audrey, following in the footsteps of her mother, came to Skye to collect folklore but she ends up looking into the mysterious disappearances on the island...but what darkness is she about to uncover? The Story Keeper will appeal to many readers as it very cleverly spans so many genres. In addition to the depiction of real historical events, it has dark, gothic and atmospheric scenery, fantasy folklore and a spine-tingling mystery at its heart. Due to the utterly spellbinding and brilliantly peculiar story line, it is one of those books that I found myself racing through but equally didn't want it to end. 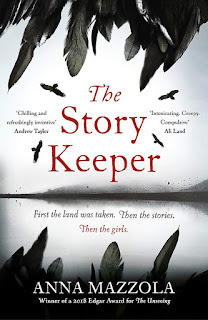 The Story Keeper is a deliciously dark, atmospheric tale with real Scottish folklore that gave me goosebumps and made me look over my shoulder a few times. With magic and mystery at play, absolutely anything could happen and this kept me on my toes from start to finish, leaving me wide-eyed in surprise as the story reached its conclusion. With this superb addition to her catalogue, Anna Mazzola has firmly secured a place as one of my favourite authors. A very highly recommended read.